Oct. 3, 2018We’ve all been there. You stroll into the grocery store, reusable bags in hand (unless you forgot them in the car again — hey, we’ve all been there, too), determined to not collect any more plastic than absolutely necessary. You’ve already eschewed plastic drinking straws, stocked up on reusable totes, and made a vow to reduce your use of single use plastics — you’re feeling good. That is, until you round the corner and come face to face with the produce section. Suddenly, those reusable totes feel pretty pointless as you fill up plastic produce bag after plastic produce bag with your favorite fruits and vegetables. This was an area you hadn’t even considered — now you’re leaving the market with way more plastic than you ever planned for. You think, “can these little baggies really be that bad? They’re so thin!” The answer is, unfortunately, a resounding yes. They’re really bad. The solution to cutting out plastic produce bags? Ditch ‘em, of course. But swearing off plastic produce bags is easier said than done. While most produce can be purchased sans bag (yes, really. Just wash it before you eat it), those bags are helpful to keep smaller produce together in your cart and organized in your fridge. 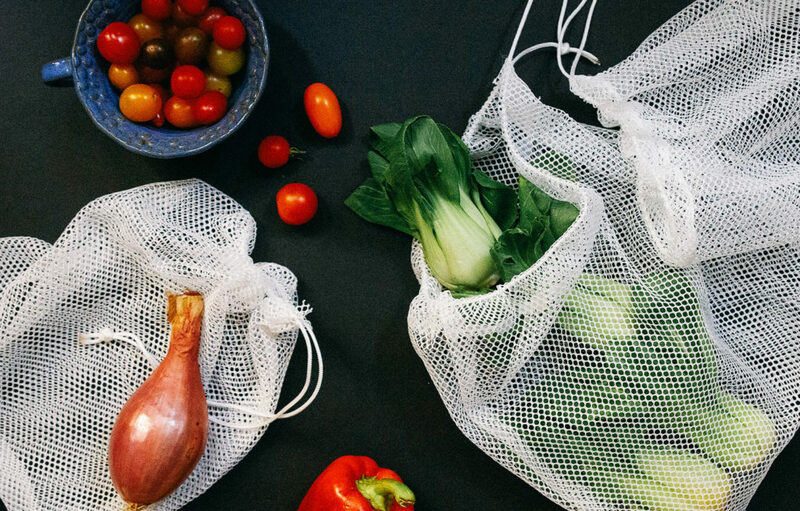 While there are plenty of ready-made options available for purchase, making your own reusable mesh produce bags is inexpensive, easy, and fun! But will reusable produce bags add weight to your purchases? While these bags are incredibly light, if you’re concerned about added weight, most grocery stores will determine the tare weight of reusable containers. Simply bring your bags and containers to the market’s service desk before shopping to have this done. And yes, this also means you can (usually) bring reusable jars to the market to use for bulk items, like beans and rice. Just be sure to check your local market’s policies beforehand. So whadd’ya say? Ready to cut plastic grocery bags out of your life for good? Read on for the how-to! Fold the fabric in half and use the ruler to measure out your bags. The bag shown here is 13”x15”. Cut using sharp fabric scissors. Now you’re going to make the area where your drawstring will go. Lay down the parchment to protect your workspace and your fingertips and lay the fabric mesh on top of this. Plug in the hot glue gun and allow to heat. Working along the longest edge of the fabric, place a line of glue about 2-inches down from the edge. Fold over the edge of the fabric and stick only the edge to the line of glue. Carefully press the parchment over top (it will be hot). Continue glueing and pressing along the entire length of the top of the fabric. Now, fold the fabric in half with the drawstring seam facing out. Line up the edges. Use the glue gun to glue a line of glue just below the drawstring seam and ½-inch in from the fabric edge. Use the parchment to press the two sides of the fabric together with the glue to create a seam. Repeat this step with the bottom of the bag. Now flip the bag right-side out. Now it’s time to make the drawstring. Using the opening of your bag as measurement, cut a length of nylon cord that’s three times the length of the bag opening. Insert the string into the space you made for the drawstring in step 1 and work it through to the opposite end. Tie the ends together in a knot. Note: To prevent your cord from fraying, carefully use a lighter to fuse the ends. Done! Repeat these steps to make as many bags as you need. This 2-yard length of fabric made 8 bags of varying sizes. Make some smaller bags for herbs, and larger bags to hold greater quantities or extra leafy greens.